12/25/2004 Over 1,200 Articles Posted! Nearly 80,000 People Downloading A Salvation Page Per Year! The Lord Jesus Christ was eternally rich, glorious, and exalted; but "though He was rich, yet for your sakes He became poor." As the rich saint cannot be true in his communion with his poor brethren unless of his substance he ministers to their necessities, so (the same rule holding with the head as between the members), it is impossible that our Divine Lord could have had fellowship with us unless He had imparted to us of His own abounding wealth, and had become poor to make us rich. Had He remained upon His throne of glory, and had we continued in the ruins of the fall without receiving His salvation, communion would have been impossible on both sides. Our position by the fall, apart from the covenant of grace, made it as impossible for fallen man to communicate with God as it is for Belial to be in concord with Christ. * "Egyptian, Masonic, Satanic Connection" - This valuable book proves beyond all doubt that a tight tie exists between Freemasonry and Satanism. This author examines the rituals, doctrines, and literature of Freemasonry, comparing it to identical literature in both Satanism and Ancient Egyptian Mysteries. Since Masonic leaders -- like Albert Pike -- admit that Freemasonry is IDENTICAL to the Egyptian Mysteries, this line of study is absolutely critical. 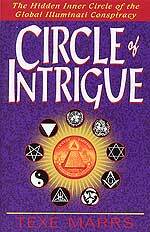 The Egyptian Mysteries is the original headwaters for both Satanism and Freemasonry. * "The Great Seal of the United States: Its Occult Meaning"
Your eyes will be opened by this study, as you realize that the symbols which comprise the Great Seal are blatantly Masonic and deeply occultic. 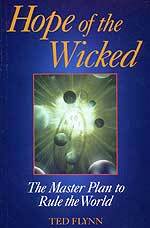 From the very birth of our nation, occult forces have been mightily at work in order to subvert our American government and way of life so the Plan of the Great White Brotherhood may go forward to produce their spiritual superman, Antichrist. 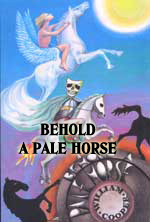 Behold A Pale Horse* BACK INSTOCK -- "Behold A Pale Horse: One of THE Books Exposing Illuminati Plan" - Cooper writes about the coming New World Order, and the Plan, which the "Power Elite" of this country and this world are implementing, that will bring about the Global Government, Economy, and Religion. Cooper is dead set against this coming global government, and urgently shows how the Plan is proceeding NOW. Cooper provides much first hand information based upon his career in U.S. Naval Intelligence, on the energetic leadership our Government is providing to implement this global system of Government, Economy, and Religion. 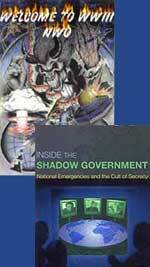 Two explosive resources to enable you to better understand the Illuminati plan for Global Government. "Welcome To World War III" video examines the Iraq War, Homeland Security, Bio-Chip as "Mark of the Beast", and the continued deadly threat from both China and Russia "Inside The Shadow Government" book examines the role Presidential Executive Orders play in the plan to overthrow our Constitutional government so an absolute dictatorship can begin. Cutting Edge researcher noted that this book reads easily. Combined Retail is $37.94; save nearly $8.00 when you buy this combination offer - This Combination Offer also available as a VHS and Book , same retail and same savings. 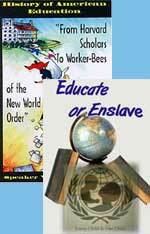 * "Combo Offer: DVD "History of American Education: From Harvard Scholars to Worker-Bees" & DVD "Educate or Enslave: Changing Our Children's World View"
These 2 videos together retail for $39.98, you save nearly $10 when you buy them together.This Combination Offer also available as a VHS, same retail and same savings. 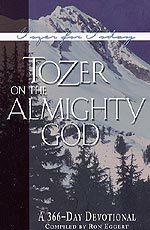 These 366 devotional classic readings will stimulate your hunger for God, help you know Him by studying His attributes and encourage you to trust, to obey, but especially to worship, our Almighty God. Scripture index included. In times of great Church apostasy, we need to return to our great spiritual roots, back to the "Old Paths"
"Thus saith the LORD, Stand ye in the ways ... ask for the old paths, where is the good way, and walk therein, and ye shall find rest for your souls." [Jer 6:16] "Having eyes, see ye not? and having ears, hear ye not? and do ye not remember?" [Mark 8:18] The Baptist heritage is one so glorious that we would greatly enrich our spiritual lives if we knew about those dedicated saints of old! Sadly, the history of the Baptists has largely been written out of religious and secular history books, even though the Baptist movement predated Martin Luther by centuries! 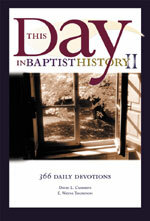 Did you know Baptists are not Protestants? 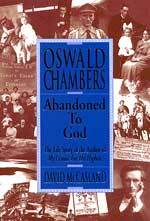 Over the past century, tens of thousands of Christians have drawn solid spiritual insight and wise counsel from this devotional by C.H. Spurgeon. Now, a new generation of Christians can again enjoy Spurgeon's beautiful prose and elegant command of the English language, as he writes with the power of the Holy Spirit. 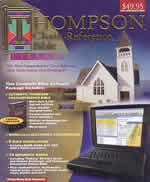 Thompson Chain Reference Study Method is the most comprehensive Bible Study System ever developed. This complete Bible software program includes: 1) Thompson Chain-Reference Bible with more than 9,000 topical outlines, 100,000 marginal notes, parallel chapter/verse analysis, Biblical archaeology and character studies, plus much more; 2) Electronic Concordance; 3) 8 Bible translations, beginning with KJV; any of these translations may be displayed on the screen in PARALLEL! All 8 translations may be displayed in parallel for easy comparison! 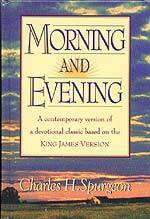 One of the translations is SPANISH; 4) 34 Reference Works, including Talking Strong's Greek and Hebrew Dictionary and Thompson Exhaustive Topical Bible, plus commentaries, several dictionaries, topical helps, classic Christian works, maps, photos, and much more; 5) "Morning and Evening Devotions", by C.H. Spurgeon; 6) E.M. Bounds; John Bunyan, "Pilgrim's Progress". I. A most startling development has occurred in the public debate over Iraq: a major Illuminist daily newspaper founder has called for President Bush to withdraw all troops from Iraq "sooner rather than later". Are we witnessing the beginning of a public media Dialectic Struggle which might finally result in our withdrawal? In Vietnam, once this media debate began, it took five years for us to get out. This story represents a major -- and planned -- development in the war against Iraq. Consider the following pertinent facts which make this story so very unique. 1. Allen Neuharth is a major Illuminist media player. He founded USA Today, a major daily national newspaper which most definitely follows the major emphasis on the developing global government, economy, and religion. USA Today was the first successful attempt to establish a national daily paper, and presented a major competition to smaller hometown newspapers, for it offered a more colorful daily newspaper at the same newsstand cost. And, it presented the standard "party line" as it presented the gathering global institutions the Illuminati so desires. 2. Neuharth published a book in 1989 entitled, "Nearly One World" which gloated over the reality that the major obstacles which have always stood in the way of a Global Government, Economy, and Religion are now nearly overcome. The statistics Neuharth presents in this book are breathtaking, brining the reader to the understanding that the prophetic global institutions which will serve Antichrist and the False Prophet are nearly here. Cutting Edge quotes this book extensively. 3. Since Neuharth is a World War II veteran, his call for President Bush to withdraw from Iraq "sooner rather than later" is a major "shot across the bow" against the President's policies. In like manner, major news outlets began to turn against the Vietnam War during the latter days of the administration of President Lyndon Johnson. Richard Nixon won the 1968 election partly on the strength of the powerful currents of anti-war sentiment set off by the opinions of Mass Media. 4. Also since Neuharth is a World War II veteran, his call for young men to avoid duty in Iraq if and when called. This portion of his anti-war blast may be the most significant. Even most soldiers who oppose this Iraq war will find it reprehensible that a responsible national authority like Allen Neuharth of USA Today could be calling for soldiers to refuse to serve if called upon. Yet, Neuharth has given no indication by past behavior that he is an Illuminist who has decided to jump ship and suddenly turn against his masters. Therefore, you have to entertain the possibility that his anti-war blast may just represent the beginning of the planned campaign to discredit President Bush for his Iraq War. In this vein, please consider the next stories. BOOK or VIDEO II. The Washington Post published a major article in which Bush Administration officials and the military under Bush's command, are guilty of War Crimes! Once again, we are confronted with the reality that one Illuminist is tearing another one down, in public. When this occurs, we are alerted to the probability that we are looking at the outworkings of a new portion of the major plan. "THANKS TO a lawsuit by the American Civil Liberties Union and other human rights groups, thousands of pages of government documents released this month have confirmed some of the painful truths about the abuse of foreign detainees by the U.S. military and the CIA -- truths the Bush administration implacably has refused to acknowledge. Since the publication of photographs of abuse at Iraq's Abu Ghraib prison in the spring the administration's whitewashers -- led by Defense Secretary Donald H. Rumsfeld -- have contended that the crimes were carried out by a few low-ranking reservists, that they were limited to the night shift during a few chaotic months at Abu Ghraib in 2003, that they were unrelated to the interrogation of prisoners and that no torture occurred at the Guantanamo Bay prison where hundreds of terrorism suspects are held. The new documents establish beyond any doubt that every part of this cover story is false." Soon after the attacks of 9/11, Cutting Edge began to warn our readers that the Bush Administration was severely determined to use torture against people whom it deemed were "enemies of terror". Our first article pointed out that this desire to use torture against suspects who had never been tried for any crimes was occurring on American soil. If you have not read NEWS1885, entitled, "BUSH - ASHCROFT ARGUING TO 9TH CIRCUIT COURT THAT THEIR GOVERNMENT CAN TORTURE AND SUMMARILY EXECUTE PRISONERS WITHOUT THE COURTS HAVING ANY JURISDICTION WHATSOEVER! ", we encourage you to do so, for the official reasons given for torturing and executing terror suspects on our soil could easily be turned against naturally-born American citizens at some future date. * NEWS1913 - "BLOOD IN THE STREETS" STRATEGY -- Part 1 - Sexual Abuse and Specific Humiliation of Iraqi Prisoners"
"... the documents show that the abuse of prisoners was already occurring at Guantanamo in 2002 and continued in Iraq even after the outcry over the Abu Ghraib photographs. FBI agents reported in internal e-mails and memos about systematic abuses by military interrogators at the base in Cuba, including beatings, chokings, prolonged sleep deprivation and humiliations ... Soldiers found to have committed war crimes were excused with noncriminal punishments ... But the documents also confirm that interrogators at Guantanamo believed they were following orders from Mr. Rumsfeld. One FBI agent reported on May 10 about a conversation he had with Guantanamo's commander, Maj. Gen. Geoffrey D. Miller, who defended the use of interrogation techniques the FBI regarded as illegal on the grounds that the military "has their marching orders from the Sec Def." This charge was made early and often by Brigadier General Janice Karpinski, the commander of the Abu Ghraib prison during the time these tortures were being carried out. We covered this story in numerous newsletters, but most notably in Newsletter for September 18, 2004, Paragraph II. We reported that General Karpinski alleged that responsibility for creating and carrying out this campaign of torture and sexual humiliation could be traced all the way to the White House. We also report on similar allegations by Seymour Hersch, in his book, "'Chain of Command: The Road From 9/11 to Abu Ghraib'. We learned that President Bush authorized a super-secret organization -- SAP, or "Special Access Program" -- for the express purpose of setting up an operation which could quickly and brutally interrogate prisoners without the CIA or the Congress being aware. The procedures authorized were most definitely outside the boundaries set by the Geneva Convention and outside American Federal Law. From this SAP, the torture and sexual humiliations flowed. We also list other sources during this newsletter to help you understand the full picture developing here.
. We have noted, since February, 2004, that a deliberate campaign by powerful Illuminist figures seemed to be underway in a concerted effort which can only have one result: to discredit President Bush. Behold A Pale Horse III. As security in Iraq continued to unravel at a terrifying pace, an insurgent suicide bomber infiltrated an American military base in Mosul, killing at least 22 soldiers about to sit down for lunch. "THE deadly attack on a United States military base in Iraq which killed 22 people on Tuesday appears to have been caused by a suicide bomber who infiltrated the camp. Investigators sifting through the wreckage of the canteen tent at Forward Operating Base Merez, near Mosul, were yesterday reported to have discovered the remains of a torso and a suicide vest ... The Ansar al-Sunnah army described the attack as a 'martyrdom operation', a reference to a suicide bomber." Initial reports from Coalition HQ indicated that a rocket had hit the base. However, insurgent forces immediately stated that this was the work of a suicide bomber. News analysis on Wednesday, 12/22, noted that, if the attack was carried out by a lone suicide bomber, that fact would cause great heartaches for the Pentagon. Our officials would have to admit that the insurgency had infiltrated even closely-guarded military bases. Now, we see that even our military is admitting that the explosion was caused by a lone suicide bomber. This horrifying reality means that the insurgency has successfully infiltrated even our most secure military bases. Not only have they infiltrated the newly-formed Iraqi police, para-military units, and Army units, they have now infiltrated American bases. This kind of development is the stuff by which insurgencies can defeat their vastly superior military foe. Political fallout immediately began to spread, causing the Brigadier General in charge of all operations in that area to accept responsibility. "WASHINGTON - The Army general in charge of northern Iraq took 'personal responsibility' yesterday for the Mosul mess hall bombing that he said probably was carried out by a terrorist wearing an Iraqi military uniform. 'I failed to identify some shortcoming that allowed this to occur', Brig. Gen. Carter Ham, commander of 8,500 troops in U.S. Task Force Olympia, told CNN. The mea culpa came just hours before Defense Secretary Donald Rumsfeld paid a surprise visit early this morning to Forward Operating Base Marez, where 14 G.I.s were among 22 people killed by a suicide bomber Tuesday." When a Brigadier General offers his troops and the American people an apology of this magnitude, you know the political pressure on him and on his entire chain of command upward, including both Defense Secretary Rumsfeld and President Bush, has to be amazingly intense. Furthermore, when General Ham confesses his fear that a "copycat bombing" may occur, he is acknowledging that the American military can do little to prevent a recurrence of this type of attack. Right on cue, Defense Secretary Rumsfeld flies unannounced into Mosul to meet with troops, trying to "buck up" morale, and to convince the American people that he is doing everything humanly possible to safeguard our troops who are fighting and dying to achieve the Administration's goals in Iraq -- first and foremost that January 30 election. As Iraq attempts to prepare for this election, security of the polling places and for election workers is of paramount importance. Time and time again, UN Secretary General Annan has expressed doubts that military and police security will be effective enough to adequately guarantee the integrity of the election. Conversely, President Bush and his officials have equally strongly maintained that security will be tight and effective. Therefore, this sudden demonstration of lack of security on the American Mosul military base can only devastate the American position. Toward that end, insurgents began to strike at election workers. IV. Insurgents struck directly at election workers in broad daylight in downtown Baghdad, where you would expect to find security the most effective. "BAGHDAD (AP) - A brazen daylight attack in the heart of Baghdad with rebels executing election workers in cold blood served as a chilling reminder Sunday of the deteriorating security situation in the Iraqi capital with just more than a month before crucial parliamentary elections. A series of pictures taken by an AP photographer show three pistol-wielding gunmen, who had earlier stopped a car carrying the election officials and dragged them into the middle of Haifa Street in the midst of morning traffic." For those of you who astutely read our Daily News Updates, you will recognize the name of this street, for it has been the scene of constant rugged fighting between American troops and Iraqi insurgents. Much blood has already been spilt on this dry, dusty street, but this cold-blooded, public execution has to be unnerving to all Iraqi citizens who are contemplating participating in the January 30 elections. You see, the insurgency views anyone going to an election booth as a traitor cooperating with American forces, and as such a logical and legitimate target. The insurgency already views Iraqis who join the police forces and the army as traitors, and last week we read that over 1,000 such men have died in the past months. This tactic appears to be working very well so far; now, let us go back to our Canoe story to see how the brutality with which these public executions were carried out will intimidate even more Iraqi citizens. You can rest assured that these scenes will be played again and again and again on Arab TV, and will intimidate many, many prospective voters. Not surprisingly, a candidate from the minority Sunni party issued a call to suspend the elections, at least for a while. "A senior Iraqi Sunni Muslim politician who is running in the Jan. 30 legislative elections in his country has called again for balloting to be postponed to ensure wide participation. Sunni elder statesman Adnan Pachachi was quoted in Lebanon’s leading An-Nahar newspaper on Thursday as saying all Iraqis of different political, religious, national and ideologies should be given the opportunity to participate in the political process. He said an election in which not all are involved would lack legitimacy ... Pachachi ... expressed concern about the deteriorating security situation and warned the Americans against the excessive use of force ... Iraqi insurgents, many believed to be from the Arab Sunni Muslim minority, have stepped up their campaign to disrupt next month’s elections. Sunni clerics in Iraq have called on their followers to boycott the polls." V. The security situation is getting so bad in Iraq, American veterans are beginning to get the feeling that slipping down the Iraqi slippery slope just the way in which we slipped down in Vietnam. * "American political leaders insisted we would wipe out those Iraqi terrorists and criminals in no time, but it didn't happen. Just like in Vietnam." * "The U.S. media insisted that nearly all Iraqis welcomed U.S. occupation and that Iraqis would love Americans for giving them democracy and freedom. But Iraqi insurgents are killing Americans, and U.S.-trained Iraqi troops refuse to die for the U.S. occupation of their country. In Vietnam, Vietnamization failed. In Iraq, Iraqization is failing." * "Last week we were told that many of the roads in Iraq are too dangerous for U.S. armed truck convoys, forcing our military to use aircraft to ferry supplies to outer bases. Vietnam taught us that when you give up the land, you give up the people; when you leave the roads, you have lost the war. Iraq is just like Vietnam." Did you catch this bit of information? We should have learned from Vietnam that "when you leave the roads, you have lost the war". Therefore, last week's announcement that Air Force transports and Army helicopters were taking over much of the routine resupply effort from land-based convoys, that announcement was the sound of defeat, not victory. * "Tonight on ABC evening news, U.S. military general whines: “There are no front lines, they can be anywhere.” Just like Vietnam." "We have killed 100,000 Iraqis: children, wives and husbands, mothers and fathers, grandparents, neighbors, cousins, aunts and uncles, school friends--we have killed so many Iraqis that there is now a limitless supply of outraged Iraqis who want to kill Americans." * "Believing our military technology can incinerate any ragtag opponent, hubristic thinking ... enabled us to also bury history. Our national hubris obliterated the memory that those ragtag Vietnamese defeated the world’s greatest military, our military ... Like the Vietnamese, the Iraqis will not fight a war that allows U.S. war technology to be effective ... the Iraqis understand that they do not have to win the war against the United States, merely not lose the war. They have learned to stay clear of the overwhelming firepower of the U.S. military and to survive another day, another month, another year." "we could not have won in Vietnam, and we cannot win now in Iraq. 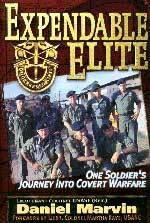 The world of insurgents understands our military and knows how to wear down the great military leviathan. Our chances of winning in Iraq are the same as they were in Vietnam: zero." * "During the Vietnam era, we heard that America lost the war because of the cowardly politicians, the unpatriotic antiwar demonstrators, and the traitorous media." During past weeks, we have begun to hear the same old tired refrain. Watch for super patriots to launch more verbal and threatening attacks on those Americans who have always criticized this war, and who have been proven right in their original analysis. Last week, two prestigious "think tank" firms climbed on board this concept that we cannot win in Iraq. "America's handling of the occupation of Iraq came in for scathing criticism yesterday, with government officials accused of living in a "fantasyland" and failing to learn from mistakes made in Vietnam. A report issued by the independent Centre for Strategic and International Studies charged that the occupation had been handled by "ideologues" in the Bush administration who consistently underestimated the scale of the problems they were facing and this had contributed to a culture in which facts were wilfully misrepresented." This last sentence means that President Bush and his officials lied so often that they created a "culture in which facts" were distorted, invented, or twisted. Almost one year prior to the Iraqi invasion, Cutting Edge was repeatedly warning our readers that the news coming from the White House and the Pentagon were nothing but cleverly created lies. Our warnings have been too terribly true in the 20 months since the invasion. Further, Cutting Edge began warning soon after our takeover of Baghdad that, in the final analysis, this Iraq war must be seen as a disaster for President Bush. Now, everyone who is slightly discerning is seeing this reality too. At this point, the authors of this article listed all the ways in which our strategies, tactics and assumptions have been so totally wrong. Several times, these authors noted that these blunders were caused by "ideologues" who should have known better, but who have now plunged us into a situation "reminiscent of Vietnam". We encourage you to thoroughly read this article. Who are these "ideologues" who have driven President Bush into this quagmire? This article did not specify, but over the past year, we have heard increasingly acrimonious charges that Born Again Christians who believe this war is doing God's work and is fulfilling prophecy are to blame for this impending disaster. Before all is said and done, this war may yet discredit genuine Christians. VI. President Bush suffered another severe blow to his hopes of stabilizing Iraq when a major military contractor called it quits! Note that this decision was announced very quickly after the American base at Mosul was successfully infiltrated and attacked. "A leading American contractor has pulled out of a major Iraqi reconstruction project, the latest sign of how the ever-increasing violence in Iraq threatens to overwhelm America's plans to democratise and rebuild the country. The news emerged less than 24 hours after the devastating explosion at the US military base near Mosul in which 22 people were killed, including 14 soldiers and four contractors, which has sent shock-waves through the United States ... Meanwhile a big US contractor has pulled out of the $20bn (£12bn) reconstruction effort. According to The Los Angeles Times, Contrack International, which heads a partnership that won a $325m contract, one of 12 major reconstruction contracts awarded this year, has stopped work on the project because of 'prohibitive' security costs. The deal is the largest so far in Iraq to fall victim to the insurgency. The fear is that other companies may follow Contrack's example, or decline to tender for work, further imperiling the prospects for reconstruction." The numbers of private contractors in Iraq have been estimated between 15,000 - 20,000 men, almost all of whom are former military special forces. As Rumsfeld deliberately discredited original Pentagon estimates of 360,000 men -- sending in only 140,000 -- these highly specialized, well-trained and well-armed fighters were deemed to be the answer for our lack of regular forces soldiers. 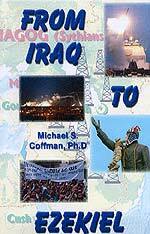 The Iraqi insurgency viewed the contractors in much the same light. If you recall earlier this year, a number of private contractors were deliberately singled out and murdered. Four contractors were caught in a jeep in downtown Baghdad, surrounded by many hundreds of people, pulled out of the vehicle, and brutally murdered. Other contractors were discovered murdered in their apartments. But, now, this article continues, swinging attention once again to Defense Secretary Rumsfeld and his boss, President Bush. "For Mr Bush ­- described by one visitor to the Oval Office as "distraught" by the carnage ­- the onrush of events could not happen at a worse time .... Now, the attack could further undermine support for Donald Rumsfeld, the Defence Secretary, widely blamed for not sending enough troops to Iraq, and for not ensuring adequate protection for those who are there. Even worse, the President's ambitious domestic agenda could be at risk if the Iraq crisis spirals out of control. the attack in Mosul has nonetheless come as a dreadful shock, made even worse amid the festivities of Christmas. 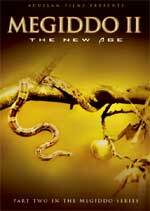 Some American media have suggested it could be a watershed in the unhappy history of post-Saddam Iraq." The fundamental reason that Iraqi reconstruction cannot work is that the average person on the street is so opposed to our effort in their country that they do not want it rebuilt if the rebuilding is to be done by American money, technology, and control. In this regard, Iraq is a parallel to Vietnam. VII. One of President Bush's closest advisers delivered a huge blow against our former ally, Taiwan. His remarks may actually be seen as an implicit "green light" for China to attack. Was this policy envisioned by Bush's Conservative voters? "The United States is not required to defend Taiwan if Beijing launches a war against the island, according to Deputy Secretary of State Richard Armitage. He made the comments in a TV interview aired Monday .... Armitage described Taiwan as the biggest landmine in Sino-U.S. relations. Asked whether the U.S. would defend Taiwan in the event of an attack, Armitage said: 'We have the requirement with the Taiwan Relations Act to keep sufficient force in the Pacific to be able to deter attack; we are not required to defend. And these are questions that actually reside with the U.S. Congress, which has to declare an act of war'." With Mao receiving all the armaments he required, while Chiang was being starved of his needs, the time came when the inevitable military defeat was at hand. Chiang escaped with most of his military to the island of Taiwan. As the Communists consolidated power, they slaughtered as many as 64 million Chinese (Ibid., p. 216). However, Taiwan flourished under Capitalism, become one of the major economic powers in world history. And, all they asked is for the United States to defend them against Chinese aggression. America did, for a number of decades, even after President Nixon recognized China and began multilateral trade with her. American officials always considered Taiwan a special friend worthy of protection. However, President Clinton began to change that policy dramatically, as he simultaneously began allow China more access to our supersecret, cutting edge technologies while denying Taiwan the ability to buy the advanced weapons systems she so badly wanted. Today, the balance of power is shifting, as the articles below indicate. However, for now, let us go back to our featured article to gain more insight into the terrible blow which Richard Armitage has just delivered against Taiwan. When Deputy Secretary of State Armitage drew a distinct line between the requirement to maintain the presence of an adequate deterrent force and the actual use of that force should an invasion occur, he just notified the Chinese that they could plan an attack and carry it out, counting upon the Bush Administration to do absolutely nothing! Is this what Conservative voters had in mind when they voted for Bush? This declaration is virtually identical to our Secretary of State testifying to Congress which nations we would defend against Communist aggression, and leaving South Korea out of that list! This omission was the signal to attack, which North Korea promptly did. Or, this declaration is very close to our ambassador telling Saddam in 1990 that we did not consider Kuwait to be our problem, but an internal problem between Iraq and Kuwait. 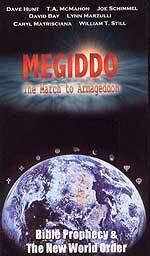 This was a signal to attack, which Saddam promptly did. VHS or DVD VII. Now that the Unity Government seems like a "done deal" in Israel, the focus shifts to the Unilateral Disengagement policy and to how quickly it can be implemented. "MKs Ophir Pines-Paz and Isaac Herzog won the top positions as the Labor Party's Central Committee voted Thursday on the list of members who would make up the party's contingent of ministers in Prime Minister Ariel Sharon's coalition ... Some 88 percent of the Central Committee's 2,188 members voted to select MKs who would take up seven ministerial portfolios in the future coalition government ... The swearing-in of the cabinet is expected to take place in two weeks ... Peres is exempt from the selection process but is still waiting for a resolution of the issue of his post as deputy prime minister along with Minister of Industry and Trade Ehud Olmert (Likud)." Last week, a fairly strong stir was created when Sharon announced that Likud Minister Olmert would succeed him as Prime Minister should anything happen to him. Liberal Labor Chief, Shimon Peres, immediately objected, announcing that Labor would not enter into a Unity Government after all, if Peres could not be Deputy Prime Minister. Such an agreement would have to pass the Knesset, so a "Peres Law" was immediately introduced. To that subject, let us now turn our attention. However, events began to move on the ground which suggested that the Unity Government is an accomplished fact, awaiting only the "window dressing" of the final agreements. Unilateral Withdrawal began to move closely enough that both sides hardened their position, while the IDF began readying for their role as the administrators of the plan. "Twelve right-wing legislators have vowed to act as human shields to prevent evacuation of settlers under Prime Minister Ariel Sharon's proposed disengagement in the Gaza Strip ... lawmakers Wednesday signed a petition written on official Knesset stationery, the text of which Maariv daily quoted as reading: "We, members of the Knesset of Israel, commit ourselves to appear in Gush Katif when called, to block with our bodies the immoral and inhuman expulsion of thousands of heroic and pioneering settlers." This dramatic stand was initiated by the National Religious Party, the very type of religious organization which is anathema to Sharon and Peres. They are the ones leading the fight to preserve this land of future generations of Israelis, and cannot understand how it is that "Conservative" Sharon is now implementing the very policies for which Liberal Labor PM Rabin was assassinated and for which Labor Prime Ministers Peres and Barak were defeated at the polls. These religious leaders might do well to actually read our analysis on this critically important subject, for then they might understand: NEWS1911, "Proofs of A Conspiracy: Oslo Accords Were Originally Designed In 1993 To Give Large Chunks of Israel Back To The Palestinians -- Exactly Where 'Hardliner" Sharon Is Leading Now." "The opponents of the disengagement plan sharpened battle lines Tuesday when dozens of settlers donned orange Star of David badges, comparing the evacuation of settlements to the Holocaust. While the move sparked widespread condemnation throughout the country and abroad, the Council of Rabbis of Judea, Samaria, and the Gaza Strip supported the settlers' opposition by calling for civil disobedience against security forces participating in dismantling Jewish communities in Gaza or the West Bank." My breath was taken away when I learned that opponents of Sharon's Unilateral Disengagement plan had planned their opposition around a very similar symbol -- the Star of David. They planned to have opposition settlers who were about to lose their homes and their land pin an orange Star of David on their clothing. Of course, this is reminiscent of the yellow Star of David Hitler forced all Jews to wear just before he began to move them into the ghettos, a move that immediately predated the "Final Solution" known as the Holocaust. This historical reality immediately prompted outrage from many groups, ranging from Conservative to Liberal. These people believed that this symbol was not appropriate to a struggle between a Jewish government and its citizens. After all, since Hitler was the head of the government forcing the Star of David symbols on each Jew, Sharon is cast into the role of Hitler in this current situation. For this reason, the orange Star of David campaign was stopped yesterday. The final point of this article is that the attitude of the settlers opposing forced eviction seemed to be hardening, and that might mean violence. "Notice of the hardening posture to the disengagement plan on the part of the settlement leadership – which officially opposes all acts of violence – triggered anxiety among Israel's top security officials. In a session before the Knesset Foreign Affairs and Defense committee, IDF Chief of General Staff Lt.-Gen. Moshe Ya'alon expressed concern regarding both the hardening of the settlers' stance and the phenomenon of soldiers' refusal to serve. In a speech to policemen on Monday night, Israel Police Insp.-Gen. Moshe Karadi wondered whether his officers would be able to carry out the disengagement if faced with staunch resistance. The police chief clarified his statements Tuesday, saying his forces will do "everything in their power to enforce the law." While the attitude of the settlers certainly has hardened toward PM Sharon and his policies, one major Israeli news source doubted that the movement could produce the kinds of numbers which would stall Sharon's plan in its tracks. "When is a crime not a crime? May a Holocaust symbol be used to promote any other cause? What is an illegal law? And what is an illegal military order? These questions have been tossed back and forth ... the entire Yesha Council ,,, stood up and endorsed Wallerstein’s call for passive resistance ... One Gazan settler contended that the evacuation would open the door to a new national catastrophe and must therefore be resisted. the attorney general declined to treat his words as criminal incitement without further study ... Wallerstein played his strongest card when he declared that if enough people were willing to follow his example and go to jail, there won’t be enough prisons in the country to hold them all ... According to DEBKAfile’s sources, the settlement leaders have drawn up a plan to pre-empt the evacuations by setting up around Gush Katif a tent city of 70,000 protesters, ten times its population and 14 times that of the police evacuation force ... But Sharon, whose efforts to broaden his minority government keep on running into hurdles raised by squabbling Labor leaders, faces a further even more dangerous obstacle to his plans. Anti-disengagement members of the armed forces under the influence of Yesha leaders - and especially its rabbis - are collecting signatures from comrades willing to refuse “illegal” orders to evict settlers - even if they are punished with jail. They claim to have collected thousands of signatures. When the total reaches 10,000, the list will be posted to the IDF’s Manpower Branch, challenging the high command to find cells for that number of miscreants. To make their resistance plans work, the settlers’ strategists must command large numbers of selfless protesters. Do they have them? And how far are they committed to passive, non-violent resistance?" As this scenario continues to unfold, the world can only sit and watch, knowing the Israel is the key to the unfolding of world events leading up to the appearance of Antichrist. 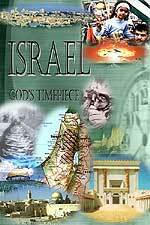 The Bible foretells it and the Illuminati has planned for Israel to be the key (NEWS1056). If Israel erupts into a major clash, with widespread bloodshed, the plan for disengagement could be forestalled. However, Israeli leadership planned this scenario in 1990-1993, before they officially launched the Oslo Accords. Surely they have anticipated the kind of resistance they would encounter and its severity. Since militaries the world over carefully plan for contingencies, we can only assume that a "worst case scenario" will not catch the IDF unprepared. After all, worldwide Freemasonry -- which is driving these events -- has waited for too many centuries to control the Temple Mount so they can build their coveted Solomon's Temple to be turned back now (NEWS164). "If we walk in the light, as He is in the light ... the blood of Jesus Christ His Son cleanseth us from all sin" (1 John 1:7). The Holy Spirit applies the Atonement to us in the unconscious realm as well as in the realm of which we are conscious, and it is only when we get a grasp of the unrivalled power of the Spirit in us that we understand the meaning of 1John 1:7, "the blood of Jesus Christ cleanseth us from all sin." This does not refer to conscious sin only, but to the tremendously profound understanding of sin which only the Holy Ghost in me realizes.